Flying into Buenos Aires' Ezeiza International airport in the morning of a sunny summer day gives a very pleasant and impressive introduction to the city. It IS a huge city by any standards, with about 3 million people in the central area and an additional 9 million people living in the areas immediately surrounding the city. Through this, the city houses a good third of the Argentinian population, and pretty much all of the richest and the poorest members of the Argentinian society. It is a city of contrasts. But the first look, if taken from a seat a couple of kilometres above the city, the main impression is that this is a big city with infinite, straight streets and lots and lots of gardens with swimming pools in them. Make sure you have a window seat on flights going there. While the flight was very good and the customs/immigrations were very efficient, getting from the airport to downtown Buenos Aires is not necessarily a "quick'n easy" experience. There are frequent airport buses, but they will set you back about 12-14 US dollars, with several even more expensive alternatives available for those who prefer to pretend they are not yet in South America for another 30-40 minutes after arriving in the continent from Europe/North America. I was definitely ready for South America, and was trying to keep a low-budget profile at that, so I settled for local bus #86, which costs just 1.35 pesos. Oh, and for the record, Argentina at the time had made it really easy for people used to US dollars; 1 peso equaled 1 US dollar. End of story. Recently Argentina changed this policy, but for now the rate is close enough to one dollar = one peso. Anyway, the price sounds like a bargain, and it certainly is, as you get no less than TWO hours of local bus riding, going through lots of the aforementioned infinite streets, streets the airport buses presumably will not even think of going anywhere near of. 40 kilometres in 2 hours may not sound very efficient, but if you, like I did, have got about 3 months or more worth of time to take from, it's a good deal. The temperature that met me in Buenos Aires was about 32C/90F, so my body reacted the way it usually does to a big change of climate; by bloating a little bit and replacing my fingers with rather useless well-stuffed sausages. I was delighted by this, as this certainly meant I was on my way to the tropical paradise that had been flashing in my brain ever since I started feeling cold on my way to the airport back home. From my seat on the bus I could start observing the Argentinian way of life; First of all, people seemed very healthy. At least they looked a lot more fit than I would have looked if I lived in a country where beef is cheap and comes in sizes "beeg", "veeeery beeg", "alf-cow" and "cow". Little did I know that the reason for the fit look may very well be that even though meat is cheap, a lot of Argentinians still can not afford it. What they can afford, though, is hair-dye, and lots of it. Of all the women I saw, especially in Buenos Aires, most of them had long hair, hanging at least halfway down their backs, and a varying but large percentage of all this hair was unnaturally blonde. I guess that adds to the fit look as well. 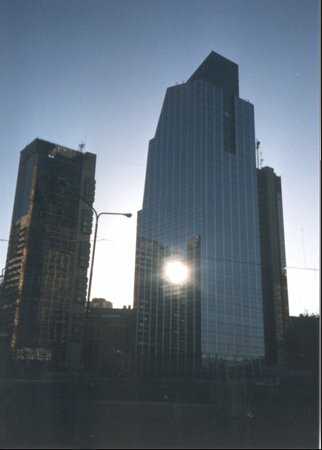 Since I had expected to be totally worn out by the time I arrived in Buenos Aires, I had booked a room for the first couple of nights in advance, through the Internet. 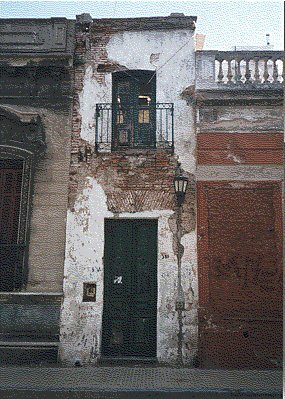 Como en Casa in Palermo Viejo. The name means "Just like home", which is quite fitting, since it actually is the home of the family running the place. It's a bed & breakfast thing, very decent in a very nice part of town. I paid about US$30 per night there, and it's a fairly good value if you're not into youth hostels. The neighbourhood is definitely among the nicest in Buenos Aires, which invariably comes with being located close to the embassies and foreigners part of the city. The sidewalks are all shadowed by nice, old trees, so you're not likely to catch skin cancer by having a look around in this area. It was striking how very dead and silent the city for a city of its size seemed. I was told the reason was that it was out-of-soccer-season, in which all the major soccer teams go to the Argentinian beach towns and cities to play summer tournaments. This, of course, leads to all Argentinian soccer fans (read: The population of Buenos Aires) having to follow them. This obviously leaves very few people, or Porteños (people from the port) as they call themselves, back in Buenos Aires. But there were heaps of cats, visibly under a bad influence from the numerous beef cattle in this country; Most of the cats I saw were nibbling away on anything green coming up from the ground, as if it was the most delightful catfood you could imagine. Buenos Aires is a city with lots of green areas and lots of street cats. I was pleasantly surprised to discover that Internet access is quite cheap in Buenos Aires, many places about US$1 pr 30 minutes or even per hour very late at night and early in the morning. They have a tradition for having lots of public call centers, "locutorios", since many people do not have phone access at home. When the Internet arrived, they simply added Internet access as an additional service at these centers, at a price people can afford. Most of these places have air-condition, free of charge, so on really warm days it can be a nice mid-day pause from the hell outside. In late February/early March Buenos Aires has its annual tango festival week, and to prepare for this, every evening in January and February you can find free tango classes and performances in public squares and building all over the city. Although I was not daring/confident enough to join in, it was great fun watching as the Porteños, young and old, went into the passionate world of tango dancing, for a while leaving their country with its 20% unemployment rate, corrupt politicians and the British occupying their beloved Malvinas/Falkland Islands. The building housing Como en Casa was old enough that they did not have power outlets suitable for my electrical shaver, and it took me a good three days of trying and failing, making several shop attendants blush and look at me as if I was a madman, before I finally managed to ask the right question in the right shop, so that I could buy an adaptor. This turned out to be a good thing, because in the morning of the third day, I walked straight into Boca, the rugged port part of Buenos Aires, where anyone not looking at least a little bit evil and/or bearded runs a big risk of being robbed or maybe even shanghaied. Well, I don't know how much of a difference it made, but I was not robbed and I certainly felt and looked more than the locals than I otherwise would have. 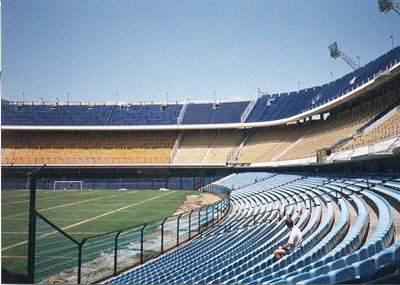 Boca is home to the most popular soccer team in Buenos Aires and Argentina, the Boca Juniors. Or maybe it isn't the most popular one, but do not even consider saying anything else if someone IN Boca asks you which is your favourite team. As already mentioned, it was not soccer season when I was in Buenos Aires, but their stadium, the enormous La Bombonera, "The Chocolate Box", was open for visitors. I was all alone there, still it was easy to imagine what it can be like there on a particularly eventful day. All the walls are covered with small greetings from the fans, some written, others scraped onto the walls with keys or coins, reminding me very much of the small plaques of gratitude that are put up around the Holy Mother altars that can be found in every South American town or city. I put up a small smiley, #8D) , so that at least something from me will witness the big battles taking place here throughout the years to come. Another favourite feature of Boca is El Caminito, which has turned into a total tourist trap, but is nice to visit nevertheless. The people who originally lived here were emigrated fishermen from Genoa, Italy, who when they came here brought with them the custom of painting their houses with whatever paint is left after having painted their boats. If this is true, in Genoa there must be many boats and houses in very bright, pastel colours, because that is what you get in El Caminito. The custom may have been utterly emphasized by large numbers of artists who have replaced the fishermen by now, but it still looks nice. There's even a McDonald's restaurant in the middle of it, which actually seems to have succeeded in blending in. Mind you, a Big Mac is just about the only cheap thing you will find anywhere near this neighbourhood. Argentina must be one of very few countries where it actually is cheaper to take enough photographs to be pretty sure you get at least one good one, than to buy one good postcard. I got a couple of postcards at US$1 each, and when you add another dollar and a half in postage, it is obvious that low-budget backpackers will rather spend their money e-mailing than snail-mailing. An attraction I regrettably did not get to see was the police museum downtown, which is supposed to have an excellent collection of the torture instruments that were in use during the 1976-1983 military regime. 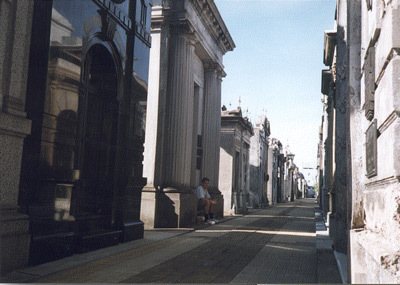 To at least get a little bit of morbidity, I went to the Recoleta cemetery, where all the rich families of Buenos Aires put their dead to rest. And Evita. After a tour throughout several cities in Europe lasting for more than two decades, she was finally brought here and put in a tomb after her husband came back to political power, in 1973. It can be a bit difficult to find her grave, unless you're going as part of a tour group, as her grave is not signposted in any way, in spite of her grave being the most visited in the whole cemetery by far. But she is next to General/Presidente Sarmiento's grave, so just look for signs showing the way to his grave, and you will find her. The cemetery in general is very impressive, so even if you're not interested in Evita, it's definitely a nice experience to wander through the "streets" between the "graves". The graves are more like houses, with many nice statues and details to see. A close second to the Pére-Lachaise cemetery in Paris, I'd say. And there is no Jim Morrisson here, so Recoleta does not suffer from the massive graveyard graffiti like Paris' Pére-Lachaise does. After 3 days, having had my dose of big city and feeling sufficiently acclimatized to warm weather in subtropical Buenos Aires I was ready to relocate. My first move was to get on the slow ferry to Colonia del Sacramento in Republica Oriental de Uruguay, just on the other side of the river mouth. If you agree to the local definition of a river, you have the pleasure of crossing a 220 kilometers wide river, the widest in the world, thereby changing your location from a frantically busy metropolis to a slow-moving beach town. Going on the car ferry takes about 4 hours, which can be spent very lazily in the sun on the top deck, but only if you bring enough sunscreen. The less skin cancer-trigging way to go is on the hydrofoil fast ferry, which covers the distance in just about 45 minutes. Whichever way you decide to go there, Buenos Aires is a whole different world away from Colonia.